Eviction—Denial of Relationship—It is not one of the ground for eviction of the tenant Eviction—Provisional Rent—Once the relationship is disputed, there cannot be any provisional assessment of the rent. Comments Off on Eviction—Denial of Relationship—It is not one of the ground for eviction of the tenant Eviction—Provisional Rent—Once the relationship is disputed, there cannot be any provisional assessment of the rent. Haryana Urban (Control of Rent & Eviction) Act, 1973, S.13–Eviction Petition—Essential Ingredients–Pleadings–Once in the replication, such facts has been pleaded, the requirements of the Act have been completed/fulfilled. 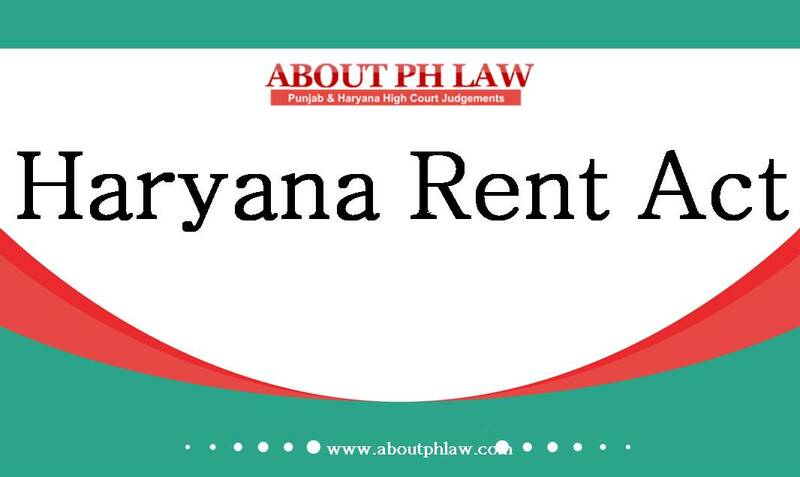 Comments Off on Haryana Urban (Control of Rent & Eviction) Act, 1973, S.13–Eviction Petition—Essential Ingredients–Pleadings–Once in the replication, such facts has been pleaded, the requirements of the Act have been completed/fulfilled. Eviction—Subsequent Events—It is not proved that plea of subsequent events had been raised before appellate court and High Court—Alleged subsequent event cannot be considered by Supreme Court. Comments Off on Eviction—Subsequent Events—It is not proved that plea of subsequent events had been raised before appellate court and High Court—Alleged subsequent event cannot be considered by Supreme Court. Eviction—Jurisdiction of civil courts is not ceased in respect of pending cases, instituted before coming into force of Haryana Rent Act. Comments Off on Eviction—Jurisdiction of civil courts is not ceased in respect of pending cases, instituted before coming into force of Haryana Rent Act. Eviction—Leave to Defend—Merits and De merits of ground raised are not to be examined—Only prima facie ground to defence which may result in favour of tenant is to be seen. Comments Off on Eviction—Leave to Defend—Merits and De merits of ground raised are not to be examined—Only prima facie ground to defence which may result in favour of tenant is to be seen.